Dr. Eugenio A. Sierra, 1760-1849, wrote his will on 9 November 1847. In the beginning paragraph that he is a native of the town of varelo, Bishopric of La Mancha and Province of Old Castile, aged eighty-seven years less five months and six days. He was actually born in the town of Valero, Province of Salamanca - which was in the Old Castille province. He was 88 when he died - not the 99 years carved into his tombstone. In the same paragraph he names his parents at Don Manuel Sierra and Dona Teresa Perez - she is really Teresa Pazos, her father's surname. Perez was her mother's surname. Eugenio's parents' and grandparents' names are all listed on his baptismal certificate. He then goes on to list both his marriages, first to Maria Josefa Caldez with whom he had one child, Gertrudis who married Alex Lessassier. He married second "Francisca Daphin" and names their children: Eualia, Isabel, Irena, Joseph and Estevan. Juan, who was a family member listed in the 1820 census, is not mentioned so it is likely that he died. He lists his various properties and the names of his slaves and the amount of money that is owed to him by some of his children. He takes out his anger over the behavior of his daughter Eulalia towards him - how she has "gravely offended me, and censured me for her infamous behavior before the marriage and in like manner by her marriage to the said Don Joseph Cadol against my will and desire, regardless of the respect and obedience due her father." He states that she is unworthy of being his daughter and he disinherits her. Eulalia is not the only one receiving his displeasure. His daughter Gertrudis Lessassier "has offended me, and dishonored me vilely in an infamous manner as proven by the judicial suit instituted against me by her husband." The lawsuit involved the estate left at the death of her mother. She and her heirs are also disinherited. Both Eulalia and Gertrudis receive two reals each, a government requirement. Her father left a portrait of Gertrudis, which was still in his possession, to her brother Joseph. Joseph, later on, deeded a small cottage on some Sierra property to Gertrudis. He appoints as his executors his son, Joseph, and Isabella's husband, Dr. John Brosnaham. 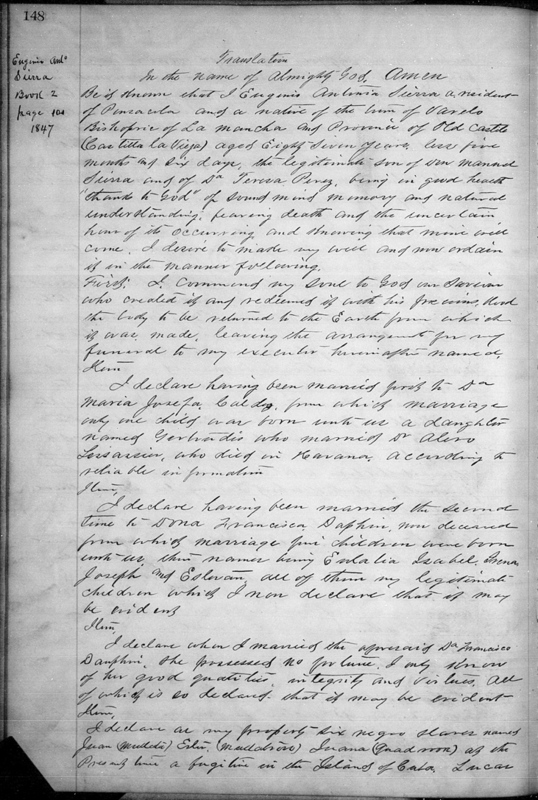 Will of Eugenio Antonio Sierra, 9 July 1847, Pensacola, Escambia County. Original will was in Will Book 2 p.104. FHL MF 941009, Will Books 1832-1870, p.148-150.